Anyone reading this needs to remember stay safe while you are painting and remember safe painting techniques are important. I never thought I'd see the day where I'd be sitting in a old truck like that. The darn thing keeps running well and therefore can´t trade it in. 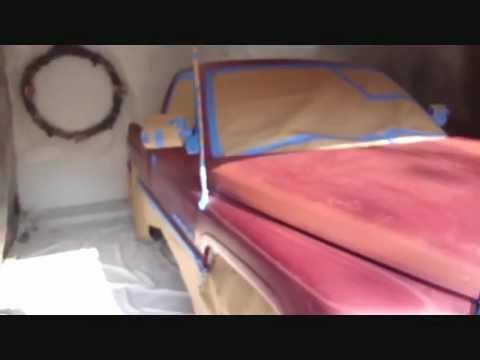 Cheap Ways to Paint a Truck is with a spray gun or using a foam paint roller to put many layers of Rustoleum on your truck or Maaco. My preference is a spray gun and Valspar (Tractor & Implement) High Gloss Enamel at Tractor Supply Co. for about $32.99. The paint job look fine and can make even an old truck look new. Maaco does cheap paint jobs, but if you got a spray gun and compressor you can do the job for less than $50.00...... Clearly, the potential for savings is clearly huge. This gives you some idea what the costs of painting a full size pickup truck. My high-pressure DeVilbiss guns is 25 years old and still working so I didn't have to worry about buying or renting a paint sprayer.